1. 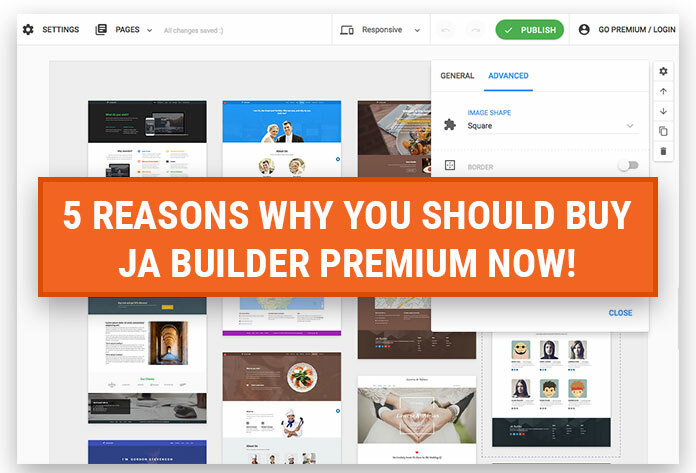 Best of the Joomla Page Builder. Takes less than 5 minutes to get the basic layout of the page. Create new page and choose from 128 blocks and the 15+ ready to use pages. 128 block variations are available now and more are coming. Which will include dynamic blocks too supporting specific extensions to extend functionalities. 20+ pages are available as on today, with 5 more coming tomorrow and every week till we reach the first milestone of 50 pages. We plan to have at least 75 ready to use pages. We would be glad to do css style customizations for you. All you need to do is give us details and post to forums. I can assure you this Builder tool of ours is worth investing in.